SCBWI New York this past weekend was surprisingly poignant and permeated by an encouraging optimism about children’s book publishing. But first was the getting there. Kristine Asselin, co-cordinator of the SCBWI conference in New England this May 3-5, arrived with me at Grand Central Station on its 100th birthday. Choral groups sang, bands played, while hundreds of people lined up in queues around the terminal. Why? One line for free gelato, another for a free shoeshine, and so on. Above it all, the spectacular zodiac ceiling by Paul Helleu. 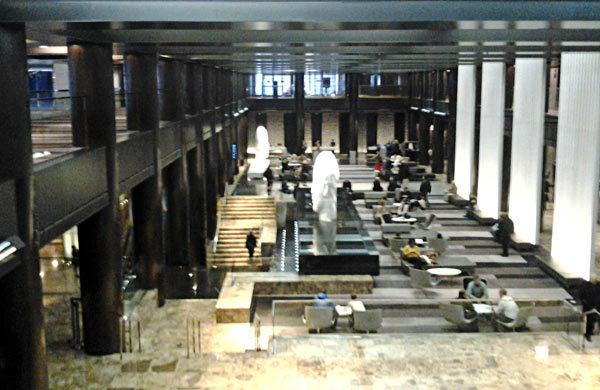 The Hyatt Grand Central, with its newly redesigned lobby graced with two serene resin sculptures by Spanish artist Jaume Plensa, was an ideal entranceway for a children’s book conference. 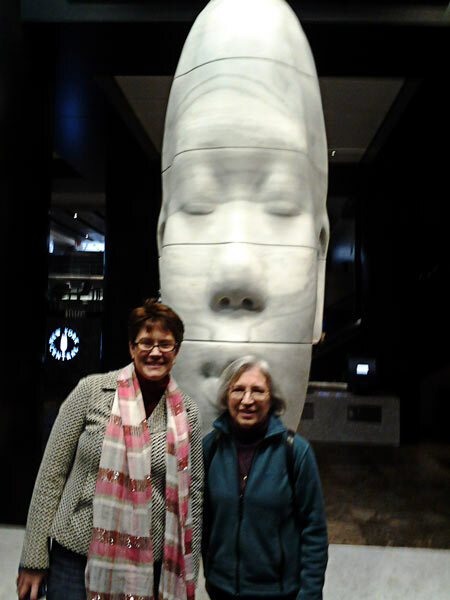 Awilda and Chloe are nearly ten feet tall and are attenuated reflections on the daughters of friends of the artist. The program for the weekend was replete with the celestials of the children’s book world: proudly snarky Meg Rosoff, charming Julie Andrews and her daughter Emma Walton Hamilton, witty Margaret Peterson Haddix and hilarious Mo Willems. Lyn Oliver excelled in conference coordinating banter while Stephen Mooser (one of whose books I had illustrated years ago) played well her straight man. Tomie dePaola and Jane Yolen gave their generous awards to illustrators and mid-list authors. Booksellers Mary Brown of Books, Bytes and Beyond, Robert Brown from Scholastic Book Fairs, and Jon Fine of Amazon gave their faceted views of the broadening, shifting industry. And there was time for two breakout sessions for each attendee. I listened to Jennifer Besser of G.P. Putnam’s Sons and Nancy Siscoe of Knopf Books for Young Readers each of whom are thoughtful curators of literature for children of all ages. Now, about that moth. I walked into the elevator to find myself side by side with Shaun Tan, whose stunning graphic novel The Arrival I own and cherish. His use of visual metaphor and the perspective of the inner child is breathtaking. What to say to him, though? I commented on the small tin moth on his lapel and an intriguing story unfolded. It was made for him by his wife, Finnish graphic designer, Inari Kiuru and is a gently rendered steampunk-like rendition of the pepper moth which was white until the industrial revolution when it darkened to the black of the soot-stained surfaces it tried to camouflage with. Once the Industrial Revolution waned, the moth reverted to its natural white. A half hour later Mr. Tan was on stage with a backdrop of his amazing art, itself so redolent of meaning, delicacy, and power. The ceiling of Grand Central Terminal wasn’t the only part of the weekend where seemingly unrelated things developed new connections. For the Friday night Portfolio showcase I brought linoleum block prints I had done to decorate my young adult novel I Am Gudrid set in the Viking Age, and a book dummy titled Jenny’s Pocket Change, which is about American and foreign coins, illustrated entirely with frottage. On the first page of the portfolio was a small graphic and this text: It is “999 A.D. and Gudrid is restless.” Later When Lyn Oliver shared the conference statistics with everyone in the Empire Ballroom she said that there were 999 attendees. One of the first people Kris introduced me to, who I spent quite a bit of time with, was Jenny Baglow Bagdigian, who in addition to writing, collects coins. On Saturday I sat next to a gorgeous woman in a black skirt suit and heels, which made her about six feet tall to my 4’11” and who owns a school for young children in New Jersey. She and I went for lunch with a woman from Texas who is a single parent with seven kids and has had a book published. I was a single parent with three kids when I started, so I can certainly empathize with her situation. Anyway, the tall ebony woman’s name is Joy Reyes and said she has always intended that if she has a little girl someday she would name her Joyce, which was so touching. That afternoon I sat with another person I had not met before, who asked about my work and so received one of my Gudrid postcards. She wanted to know how I became interested in the Icelandic sagas and I explained that my son Eric lives in Iceland and is married to an Icelander. In exchange she gave me her card. Her name is Karen Eriksson-Lee, author of The Viking Farm Tales. My son Eric’s son is named Guðjón Ericsson, following the Icelandic naming convention (Guðjón is Eric’s son). Huh. Then we listened as Margaret Peterson Haddix talked about a location in Indiana where there is a historic recreation of log cabins with interpreters from the beginnings of settlement there. She must be referring to Conner Prairie. The same Conner Prairie that vetted Log Cabin in the Woods by Joanne Landers Henry, which I had illustrated a while ago for Macmillan. On Friday when I picked Kris up on the way to the conference I gave her a copy of Log Cabin in the Woods for her daughter Katie, who is in the fourth grade. I had not anticipated these kinds of connections. Was there some magic afoot? Everyone wants to connect with editors and agents, of course, but so important also were the connections made with people, the kidlit tribe. Joyce Shore Johnson, Coordinator of the upcoming New England SCBWI conference and supreme networker, Lynda Mullaly Hunt, author of the award winning One for the Murphys, Alphabet Soup, and Director of the SCBWI’s Whispering Pines retreat , gentle Jennie Brownlow Bagdigian, whose YA novel involves a mine in which the protagonist is transported to the 1860s where she builds a life until faced with the dilemma of whether to return home or stay in her new life, Haley Bennett, a horse lover who knows the ease of an Icelandic horses’ tolt, Kirsti Call, recently published picturebook author with five kids (!) from my Andover critique group and her friends Brittany Soucy and Shannon Gish, aspiring writers from New Hampshire, Katchen Gerig, who will be joining our crit group, MarcyKate Connolly, whose upper MG fantasy Monstrous debuts in 2014 and is a fellow listener to Delirium, Sandra McKeehan, author of the first joke read by Lyn Oliver (which earned her money to buy one of Shaun Tan’s books!) and realistic watercolor illustrator from Pennsylvania and compatriot of the aforementioned Karen Eriksson-Lee, who by the way was the Director of the Northern Virginia Academy of Ballet, Suzanne Burakoff who is fortunate enough to have a Fifth Avenue, NY address and is writing about her archaeological experiences in Iran, a compelling topic. During the informal one hour portfolio display, mine was set up next to that of Lewis W. Porter who went to the Savannah College of Art. After I told him that I had seen a Helen Frankenthaler exhibit at his alma mater, we spent the rest of the hour amid volleying stories. I spoke with Margot Lemieux, Illustration Coordinator for NESCBWI about a book she had just self published based on her father’s six years in the ‘30s spent teaching in Sudan. This is perhaps the best use of self publishing I’ve heard. Fifteen minutes later Margo was given an award for her contributions toward the illustrators of SCBWI. At the cocktail party I also spoke with Marilyn Salerno, writer and Regional Advisor for New England, who has done so much for SCBWI NE. She oversaw a grant by the leader of our critique group that made it possible for editor Cheryl Klein to speak with our group. Saturday morning a young woman with fire red hair walked across the ballroom lobby to introduce herself. She is from Texas, had never been to an SCBWI conference before and I was the first person she talked to. This is a tribe of many colors, all of them radiant. There is more about the conference at the SCBWI blog. This entry was posted in children's books, creative living, Writing today and tagged children's books, Gudrid the Far Traveller, traditional publishing. Bookmark the permalink. Post a comment or leave a trackback: Trackback URL. I am not into stalking people and I’m sure that the professionals have their defenses up somewhat, being surrounded by 999 rabid free-lancers. It was enough to participate in the portfolio showcase with a dummy attached and see what serendipity cropped up. Conference attendees are not allowed into the portfolio showcase room after dropping off our work, so the pros can scan through things in peace. There is no direct feedback during the conference, but they have your postcard if they are interested. Those who signed up for the three all day intensives have an advantage, but I did not go that far. We can submit to the two editors or other professionals whose break-out sessions we signed up for. That’s golden too. Hi, could you help me getting my account activated on sculpture.net? It just doenst work for me… My name there is mr.x. Hi, I responded to you earlier this morning and forwarded your question to our webmaster. I do not know if he is available immediately, so try to be patient. He is a sculptor too. If you don’t get results after a couple of days, contact me again. Sounds like an amazing whirlwind! Makes me that much more excited for the NESCBWI conference! The NE conference has so incredibly many workshop choices! Wow. I have my list to plug in at 11:00 today. I am so honored to have been mentioned in your article! It was my first conference and what a beautiful experience it was! I hope to see you again whether at a conference – or maybe a Viking village somewhere! Peace, Love and Blessings to you! Hey Karen. I hope you do well with your “Odin and the Dragon”! Dragons are an interesting phenomenon since they appear in so many cultures around the world. One wonders where the origin of the dragon idea is? In Iceland there are no reptiles at all, even today (no amphibians either), so snakes and lizards cannot have been the inspiration. It’s a paradox. Anyway, good luck with your stories.